The Freighter Flat Top may be purchased as a stand alone trailer or in Tag specification to use with an existing Lead trailer for maximum payload flexibility. Your Freighter dealer can ensure that your truck and B-Double combination meets legal dimensional requirements while maximising your payload. 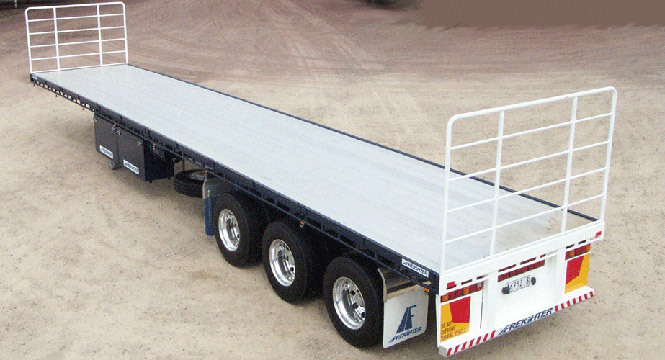 The Flat Top Semi-Trailer is available in a range of sizes. The optional Tag configuration includes radius guards and long vehicle signage. The trailer illustrated has the optional aluminium floor fitted. Designed to make you money with a low tare weight and high payload, Freighter trailers come with a two year http://premier-pharmacy.com/product-category/pain-relief/ warranty and are backed by Australia’s best national trailer dealer network. Painted with high quality two pack paint applied over grit blasted and primed steel, the Freighter trailer looks great and will retain its excellent appearance with regular maintenance. A chequer-plate floor and quality wiring loom come as standard. LED lights are also standard, providing long and reliable life and adapting automatically to varying voltages in truck power supplies. Optional twist lock pedestals in the floor allow the carrying of a shipping container. Most of all, our customers tell us that a Freighter “just tows better”.